Mohammad Al-Mojil Group is a construction company operating in various parts of the Kingdom of Saudi Arabia. In Dammam, it employs and houses and some thousands of migrant workers, among them overseas Filipino workers deployed by (1) RRJM International Manpower Services, Inc., office located at 19th Floor, Summit 1 Tower, 530 Shaw Boulevard, Manadaluyong; and (2) Philippine-RN Recruitment Agency, Inc., office located at Rm. 201 Cabrera Building 1, Timog Ave., Quezon City. Both agencies are licensed by the Philippine Overseas Employment Administration. The OFWs are suffering maltreatment and poor working and living conditions in their barracks and are grossly overworked. Their wages have been withheld for at least 4 months now, leaving them hungry, depressed and unable to provide for their families back home. Some of them have been working at MMG for as long as 20 years, while most were hired in 2011. Because of their conditions, they filed an official complaint at the Philippine Labor Office last year. Some were repatriated last December but have not yet received their back wages and end-of-service benefits (ESB). Those who have not yet received their ESBs have been working for the company for 15-20 years. Most have already filed for exit visas since the last quarter of 2013, leaving them stranded for 13 months now. Because of their complaint, MMG did not renew their iqamas, making them undocumented and in danger of crackdowns. The OFWs are particularly complaining about the slow service and facilitation of their repatriation by the POLO, citing specific complaints against Labor Attache Padaen for his inaction and poor service. 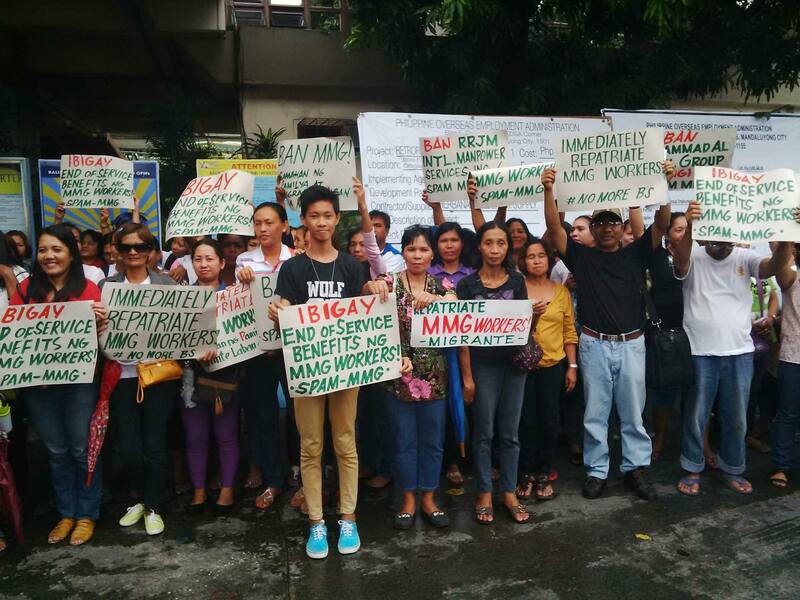 Families of the OFWs fear for the safety and welfare of their loved ones. The latest report is that Pakistani workers at MMG are already threatening to burn the barracks in protest against labor abuses and violations. As of this writing, workers of MMG are currently engaged in a strike inside the company barracks. Migrante International has already contacted its chapters in Dammam and the Kingdom of Saudi Arabia to inform them about the case. The KSA chapters are presently assisting the OFWs at MMG in the cases they filed at the POLO. Last June 28, 2014, wives and next of kin of the OFWs held a meeting at the Migrante International office. They formed a tactical formation, SPAM-MMG (Samahan ng Pamilya at Manggagawa laban sa MMG), and listed down their demands. Most of the OFWs and their families hail from Bataan where one of the local recruitment agencies has an office. Last July 4, Migrante International went to Bataan and met with more relatives of OFWs at MMG. They have all agreed to file complaints and join the campaign for their loved ones. Migrante International has also facilitated dialogues with the POEA and the Overseas Workers Welfare Administration (OWWA) on July 17 and July 23, respectively. 1. Immediate repatriation of at least 300+ OFWs at MMG. 2. Cancellation of licenses of RRJM International Manpower Services, Inc. and Philippine-RN Recruitment Agency, Inc.. Both agencies continue to deploy OFWs to MMG. 3. End of Service Benefits and other benefits entitled to the OFWs and their families. Bakit po 300+ lang ang nandyan? Halos libo po kami dito sa mmg. Until now we dont have our salaries.almost 4 months. maraming OFW ang nag tatrabaho sa MMG Group sa Saudi Arabia. Kaya sana po ay bigyang pansin ng gobyerno ang suliraning ito. Kailangan na nilang umuwi ng Pilipinas. Kaya sana po sa halip na iba ang atupagin, bigyan nyo ng pansin ang mga Pilipinong nagpapakahirap sa ibang bansa para lamang makatulong sa bansang Pilipinas. Sana naman po sa gobyerno natin. maraming salamat!! masyadong ”BUSY” si Pinoy ngayon..sa impeachment daw..pero kelangan talagang tugunan ng mga kinauukulan ang Problemang ito..mahirap manirahan saa ibang lugar lalo’t di ka dukumentado..
Sana makauwi na ang asawa ko na nagwork sa MMg for almost 22 years.walang perang pambili ng prepaid load hindi siya makatawag o makareply ng mga text.Kaawaawa ang kalagayan nila doon.Hopefully ito ang tutukan ng ating gobyerno sa halip na iba ang atupagin. Maraming salamat..
Nandiyan din ang asawa ko sa Dammam.. Sana papauwiin nalang sila ng MMG kahit walang pera na dala kasi hindi ipina renew ang kanilang mga Iqamas..baka po mahuli sila doon at makulong. Hindi nila kasalanan kung wala silang mga Iqama dahil hindi pa ni renew ng kumpanya..Sana po matulungan ng ating gobyerno ang mga ofw doon. Salamat po! isa po akong tumangamp sa 4 months agreement na offer ng mmg pra mka uwi lng. hindi sinunod ng companya nkasulat sa agreement. sna tulongan ng owwa lahat ng mangagawa sa mmg mka uwi na dla lahat ng benifesyo dhil pnaghirapan nila ito. ito nkalagay sa agreement na d sinusunod ng companya. base on your acceptance and agreement to return to wor while waiting for repatriation, mmg management assures you of the following. 3. in addition with your monthly salary the company will pay 25% of due benefets starting may payrool until august 2014.
wlang sinunod ang companya sa knilang binigay na agreement. prang niloloko nlng ang mga mangagawa. sna mtulongan ng owwa ang problema ng mga mangagawa dto sa companya. Im the wife of an OFW working in MMG Mohammad Al-Mojil Goup in Saudi and its my 2nd time writing in this blog…im seeking your help and attention to facilitate and help our OFWs presently still in the camp in Jubail, Saudi Arabia, Its more than a year of waiting to resolve this problems, They suffer a lot, even in the clinic no medicine at all even paracetamol…how many months, years for them to suffer this mal treatment. wala na silang sahod at hirap pa ang kalooban sa ganitong sitwasyon. Gutom na ang mga pamilya nila at ang masaklap pa nito if di na sila maagapan might mabalitaan nalang natin na patay na silang lahat. Siguro nga if mangyari ito(huwag naman sana) tsaka na aksyonan ng gobyerno natin, magpakahero na naman sila if makatulong sa pag pauwi ng mga labi nila, but the truth is, pinabayaan muna nilang lumaki at lumalala ang ganitong sitwasyon bago aksyonan. Maawa naman kayo sa amin, hirap na hirap at gutom na mga pamilya namin. Ang masakit pa is ang mga anak namin na nag aaral ay maapektuhan cz wala ng budget even pang baon. Please Sir/Madaam, tulungan ninyo kami, maawa naman kayo sa amin sa pamilya namin. Thanks!